In Fremont: General donations are being taken at the Fremont City Auditorium. Please contact Mike Aerni at 402-720-8863 for more information, and an updated needs list, and other special instructions. In North Bend: Please contact the donation/distribution center at 402-919-3976 for an updated list of needed items. 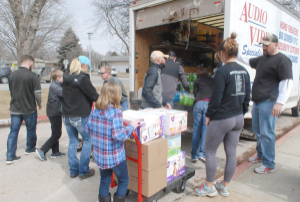 In Fremont: The contact information for the Fremont Area Volunteer Reception Center is: 402-253-0448 or fremontnebraskavrc@gmail.com. The VRC is located at St. Patrick’s Catholic Church, Delaney Hall, 3400 East 16th Street, Fremont. It will be operational from 9 a.m. to 4 p.m. In North Bend: Please contact the volunteer coordinator at 402-919-3967 for information on how to volunteer. If you're in need of support, please talk to a clergy member, counselor, or doctor. Here are some resources. The Nebraska Department of Agriculture has put together a list of disaster relief resources for Nebraska farmers and ranchers seeking assistance due to severe weather. Information on road closures can be found on the Nebraska 511 maps or by dialing 511. The Nebraska State Patrol Helpline is available 24 hours a day for motorists in need of assistance. Dial *55 from any cell phone or 911 in an emergency. Case Management hours at the Fremont City Auditorium are from 9 am to 4 pm for those affected by the flood needing additional services – anyone in the area who was affected by these floods is welcome to all supplies and services at the City Auditorium. You do not have to be a resident of Fremont to receive help!